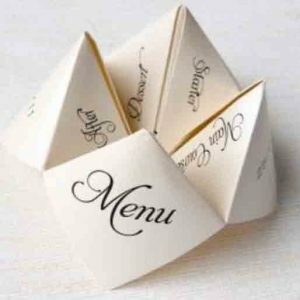 Cool, fun, interactive menu idea for wedding. Not every menu at a wedding has to be dry, bland and functional. Having a fun, unique, and stylish menu that can be kept as a memento for your guests is perfectly legitimate (and some might say to be encouraged). Some might argue that the contents of the menu are more important than the presentation, and there is some merit in that point of view. After all, you don’t eat a menu, you eat the food. But if there is an opportunity to give your wedding a distinctive and memorable touch, then why not take it? We own a mobile catering company, serving crepes at weddings across the country. So if you hire our mobile creperie for your wedding, then you are well on the way to making your wedding distinctive and stylish. But as far as menus go, the most effective way for us to display all the flavours (and there are at least twenty of them) is by means of a banner display. Make no mistake, it looks good, but at the end of the day, our wedding crepe menu not a great deal of fun. What a cool idea, huh? I’m willing to bet that as soon as you saw it, you took a mental trip back to your school days. I know I did. These things (whatever they are called) are a long since forgotten childhood toy, that I am sure we have all seen, made, played with (and subsequently forgotten) when we were younger. So if you happen to be employing a calligrapher to hand-write your invitations and stationery, then you’ve GOT to enquire how much it would be to include menus like these.They’ve got that built in, fun, surprise, playful element that’s guaranteed to be a hit. Imagine how it would feel, lifting the little flap to discover exactly what the dessert will be (crepes would be my suggestion – you can’t beat a selection of twenty flavours for your guests, in my opinion!). Imagine your guests playing games with people to see which choices they would make if choosing randomly. Imagine feeling the quality of the paper and admiring the beauty of the calligraphy (thats a very nicely executed copperplate that someone has used in the example in the photo). And imagine your guests being able to take the “menu” home as a reminder of the day and the food, showing it others who wern’t there and talking about how great your wedding was. Sadly, in our case, it is impractical for us to supply these at every wedding we attend with our crepe station. Small flyers and a large banner displaying all the different flavours your geusts can choose for their crêpe, are perfectly adequate (and actually pretty cool in many ways, due to the design) but when it comes down to it, compared to these papery things you move about with your fingers, sadly there is no comparison. But our crepes will more than make up for the disappointment.